You might be familiar with snow babies figurines many department stores and gift shops have carried for years now. They even show up at flea markets and estate sales these days. Lots of collectors love them. But the story behind the real snow baby and collectibles made more than 100 years ago to go along with that true tale, isn't often retold today. Author Patsy Moyer once published an online article about a book written in 1901, The Snow Baby by Josephine Debitsch Peary, wife of the famous North Pole explorer Rear Admiral Robert E. Peary. In this interesting feature, Moyer detailed how the Peary's daughter, Marie Ahnighito, was “the first white child born that far north.” She also notes that her middle name honored the Inuit woman who made the child her first fur clothing. Moyer's feature on baby Peary depicted two German snow baby figures as well. Little porcelain figurines like these were usually one to three inches tall, although some can be larger, and covered with bits of ground white porcelain to give them a snowy look, just like those shown here. These collectibles gained popularity in their day as news of Admiral Peary’s trek to the North Pole made its way around the world in 1909. 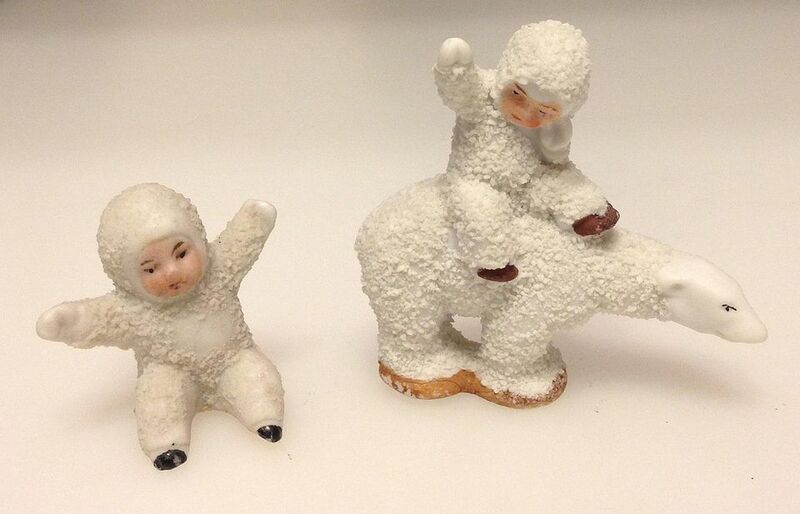 Snow baby figurines were revived again in the late 1920s when adventurer Richard E. Byrd flew over the South Pole and excitement of that news spread far and wide. Moyer also noted that snow babies were called "Alaska Tots" in a Marshall Field’s catalog dated to 1914. Those adorable one-and-three-quarter inch figures sold for 90 cents a dozen back then. They often bring $50-100 each now, depending on their pose, and collectors have noted that they're getting harder and harder to find. The oldest and most desirable snow babies from a collecting standpoint were made in Germany with great care and thoughtful detailing. They were also made in limited quantities. Like Heubach's figurines, the faces on these pieces generally have a more realistic look to them when compared to those made later in Japan and other points of origin. Older snow babies featuring blue snow can also be very desirable and even harder to find. Pieces depicting animals, Santa Claus and other themes decorated with crumbled porcelain “snow” can be found as well. While these go-with collectibles don’t actually feature the same baby characters, they are often advertised as snow babies and grouped together in displays due to their similar appearance. And these can be even costlier than the baby-shaped figures in some cases. Of course, where you find expensive collectibles, you’ll also find reproductions. They show up in online auctions on a regular basis, and you’ll find them at flea markets from time to time as well. The really bad part about these reproductions, like so many other antiques, is that the new ones are being made from old molds, according to Morrison. Some look so much like the originals that it’s hard to distinguish between old and new. One sign of new “snow,” however, is the presence of little black specks among the white. Older pieces might be a little dirty when you find them due to handling over the years, dust, and shelf wear, but you can tell the difference when you compare old and new figurines side by side. Some dubious sellers, in an effort to transform ordinary collectible figurines into more desirable pieces, are adding porcelain snow specks to plain figures produced in Germany during the same era. Many of these are marked correctly on the foot so unless you inspect them closely, you may not know they’ve been altered. To spot the fakes, look for new snow that is too white compared with the rest of the colors on the figure. And, keep an eye out for snow that has been applied haphazardly to clothing on figurines as another clue that a piece may not be all original. While many purists seek only older snow baby figures for collections, others don’t care for the expense of hunting down these rare items. They still like the sweet features and adorable poses though, and opt for new collectibles such as those produced by Dept. 56 and a host of other modern manufacturers. Since the new Dept. 56 figures are marked on the base and have a distinctive look when compared with the older snow babies, there’s no problem confusing old with new. You might be wondering though, will new snow babies be worth more than their original price tag in the future? In most instances, these mass-produced figurines have been sold specifically as collectibles so they won’t rise greatly in value over time. The exception to this rule is with limited editions made in lower production runs and special character editions that could have crossover collecting appeal. The short answer: if you like them, buy them and enjoy them. Don't be disappointed, however, if those newer figurines don't increase in value. Can You Make a Collection of Old Tin Cans?